RETURNEES LAUD the regenerative power of Reboot and this year's conclave is no different. 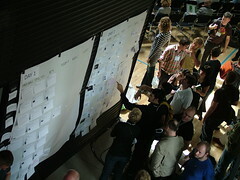 Unlike other conferences, the attendees and their conversations make Reboot's programme. The organisers don't provide anything except a venue. Twitter isn't making Reboot an easily-followed group but Jaiku offers a Reboot backchannel. This is the best back channel I have seen running at a venue because it's truly portable. For those attending who also sit inside Facebook, I think Trakzor might be more valuable. In today's Reboot session, I sit directly under a skylight and cannot see my mobile phone screen. I am going to focus on the conversation, mooch from those nearby and share thoughts later. That's the way all good conferences work. And you don't get to see and hear the best that unfolded until reading and listening to those around you as they publish their reflections a week or so later. It's happening at Reboot.dk. The Reboot images with the best eye for detail sit in Guido van Nispen's Reboot 9 photostream. Jem Stone -- "Rebooting the Web 2.0 Age"
I AM IN sponge mode at Reboot 9. I came to Copenhagen to mix and mooch. I expect to enjoy the Irish blogger's meet-up in the Shamrock Inn more than my sighting of the little mermaid. I am curious to find out whether Dave Winer has succeeded in his quest to inhibit phosphodiesterase and thereby influence circadian rhythm. The story continues between Reboot sessions. Follow the Reboot photos. 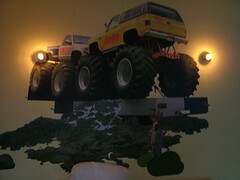 AS WE CHECK INTO Hotel Fox in Copenhagen (photo shows the image that's painted behind the bed), we're reading Jeremy Clarkson's explanation on what businessmen's hotels are like. We're not sure we'll encounter all his examples during our short stay in Denmark, but his perspective makes fun reading. ONE WAY to measure the residual effect of a major conference is by the connections you make--not by the business cards you collect. As I head off to Reboot 9, I snapped a screen that shows my Facebook network. It's dominated by James Corbett, one of the most effective social facilitators in Irish tech space. It will be interesting to see if I connect with another mother node, perhaps a Canadian who ties into the podcasters who are already part of my Facebook network. The Facebook Friend Thing is here: http://friendthing.trigse.cx/ and it's designed to do more than show Facebook data. LIKE MY DAD and his dad before him, I carry a notebook in my pocket. Mine is unruled. Dad had spiral binding on his. Grandpa marked his pages with coloured dots. Paper notebooks are the only piece of office mobility that spans the generations in my family. Most of us discard tech well before the end of a generation because product lifetimes are significantly less than a human lifespan. Pen and ink lasted hundreds of years. The typewriter spanned three generations in my family. The personal computer has lasted a single generation. I doubt the touchscreen phone I am using to create this blog post will last a single generation. WE WILL VISIT NYC on a day when the sun flows directly down the streets. That means marking out either the 28th of May or the 12th of July for the occasion because on those days, sunlight streaks down the centerline of every street. The skyscrapers that line the gridded streets of NYC's tallest boroughs normally block the setting sun. The effect makes Manhattan a type of modern Stonehenge, although only aligned to about 30 degrees east of north. Image from Astronomy Picture of the Day. Natural History Magazine on sunsets down the centrelines. LIKE IRELAND, Greenland has charming elements found only on an island. While scanning some old documents and images at home, I remembered comic elements of scarcity about Sondrestrom, Greenland, years ago. It seemed that whenever I visited there, only Orange Crush fell out of the vending machines. No matter what button you pushed, you got Orange Crush. ANYONE WHO has used the wonders of the internet to communicate knows that you should not type personal things across an open and unprotected connection. Say something exciting via email and be ready for a friend to forward your mail. Put your travel schedule on a group calendar and be ready for stalkers. Write direct messages to friends on Twitter and apply your best judgment. Until yesterday, direct messages sent by some people via Twitter appeared on the Twittervision public timeline. A few weeks ago, anyone interested could have harvested private phone numbers sent directly to me over Twitter. They could have seen some comments considered playful to one person but acerbic to another. This was an unexpected compromise of privacy but Dave Troy, the Twittervision developer, points out that most people didn't care about it. AS NEWS OF GOOGLE'S acquisition of Feedburner continues percolating, some numbers jump out of the binding term sheet. Google's $100m valuation of Feedburner puts value on each of Feedburner's feeds. Feedburner has 22,717 publishers. That means Google is paying $237 per publisher. Since I have four different Feedburner URLs, I'm worth nearly EUR 730 to Google in the deal. I don't think I could generate that kind of money through an AdSense affiliation but people who use ads inside Feedburner suggest that I'm turning away at least $200 monthly from Google because I don't monetise my RSS feeds. Some of Feedburner's larger customers might be getting a little skittish  since they now hand over major blocks of data tracking to Google's warehouse. I AM KILLING images associated with my IrishEye's newsfeed because several readers think my Flickr photos generate too much noise. I agree. There is very little tech news value in my adventures underground in Germany or my high-G turns over the Superstition Mountains. Those images have their place in a story that will unfold within 10 years. At the moment, those images, when coming from Flickr, can stall a news aggregator when it tries to run through a content filter. I have lost more than 70 regular subscribers through a combination of non-tech content bubbling up in my newsfeed and as a result of publishing fewer tech items every week. The main meal ticket prevents me from providing more daily tech bits in this space. But after Feedburner resyncs my account details, subscribers will get fewer distractions coming from this source. Coming next month: a new URL with a specific IT focus for this tech blog from Ireland.